Head Winds will Continue for Indian Iron Ore in Fy19? A New Year is always filled with expectations; but change isn't always easy and sometimes it can be hard to get motivated to embrace something new and different. Last year the iron and steel industry went through a phase of uneasy changes both globally & locally from rising tensions of trade war, price rises, M & A's, and temporary truce of trade war. 2019 should pave way for change in technology, regulations, improving skill gaps for Indian steel industry. Government should focus on the infrastructure implementation so that the consumption moves with the production rate of the steel. But the coming months might be a slow down for the Indian steel industry as the expected elections will put the brakes on the development programs. 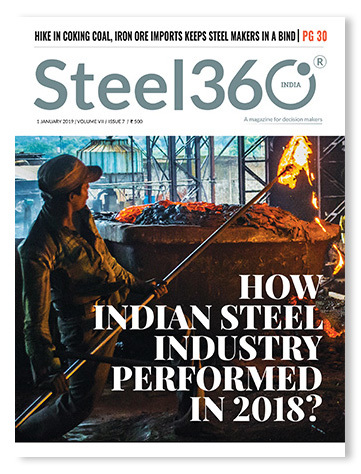 The cover story is looking back into the year 2018 performance report card of Indian steel industry, read the detailed analysis on pg no.36. Coal is one raw material to watch out in the new year, the escalating demand has pushed Indian steel producers for higher imports of the coal; another raw material is iron ore which is crusading into the imports due to limited auctions and close down of mines. Steel producers are pickled up with these raw materials read the interesting article on pg. no. 30. The future of any industry lies in Technology, steel industry have also moved with time to imbibe technology into its environment, read the exclusive interview with Per Vesterberg, on pg. no.6 who tells about the use of granulated pig iron(GPI) in steel making. *Steel 360 is a monthly magazine for Iron and Steel industry professionals. Each issue comes up with an exclusive Cover Story and insightful articles from the Industry.